People frequently ask me, especially after I return from a trip for work, "Has Haiti improved any since the earthquake?" Good question. My quick answer is, "Yes, the rubble is mostly gone." And the long answer is, "The people are still suffering, but there is hope." But last week I visited an area that I saw days after everything collapsed and killed more than 250,000 people, and it's like a knife to my heart. It was in downtown Port-au-Prince. Downtown is where much of the colossal damage took place. By that I mean, five-story buildings pancaked, entire government buildings destroyed. The presidential palace with its pretty wedding cake cupolas. 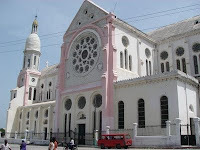 And the nearly 100-year-old cathedral, with its beautiful pink stone and soaring arches. I was there, long ago, for a prayer service. The cathedral was a peaceful place in a heavily populated city, a landmark for all who lived in PAP and a stronghold of religion for many. I remember seeing the elderly homeless on the steps. I also remember how my NGO built them a village where they can live out their last days with dignity and comfort. I've been traveling to Haiti for nearly 18 years. I visited the cathedral days after the earthquake, and saw the bodies crushed by falling debris. I was there a few days ago, and except for the fact the rubble is now gone, the structure is still the same. Still standing as an eerie skeletal frame, a pink scar on the downtown cityscape. It was painful for me to see the church still standing as if the earthquake were last month, not last year. I can't imagine how heartbreaking it is for Haitians. A constant reminder of that horrific day. How can you push on and forge a future when the wreckage of your past still stands like a tragic moment suspended in time? Haiti has a new president now. I am cautiously hopeful. Not because of the new government, but because I have seen the resilience and courage of a beleaguered people who have suffered much, and keep going. And again, against all odds. The Tiger and the Tomb now available on KINDLE!